Paneer tikka masala is an Indian dish where marinated paneer is grilled in oven or stove top and then cooked in a spicy creamy gravy which pairs super delicious with Butter nan. 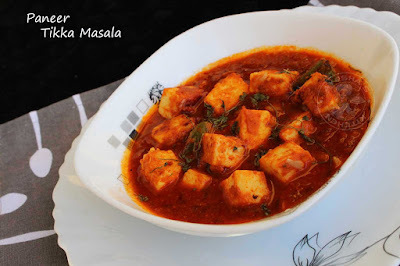 Paneer tikka masala is my favorite paneer recipes. If I put my hands on paneer, I will never go for any other paneer recipes except this paneer tikka masala. This vegetarian dish calls for simple ingredients and is very easy to prepare. Traditionally, the marinated paneer is grilled in an oven for the preparation of paneer tikka. But here am sharing a stove top grilled paneer tikka so that everyone can give this recipe a try. Marinate the paneer at least for 2 hours for the best result. You can add more cream as per your preference, I just added few teaspoons of cream only. I have also tried yet another paneer tikka masala with broiled paneer in which I skip using onion in the sauce and that makes the dish creamy orange-red color. Anyway, hope I can share that recipe soon. Paneer recipes/paneer dishes can be made in a number of ways. Either a curry version or dry version or just combined with some veggies and like so. 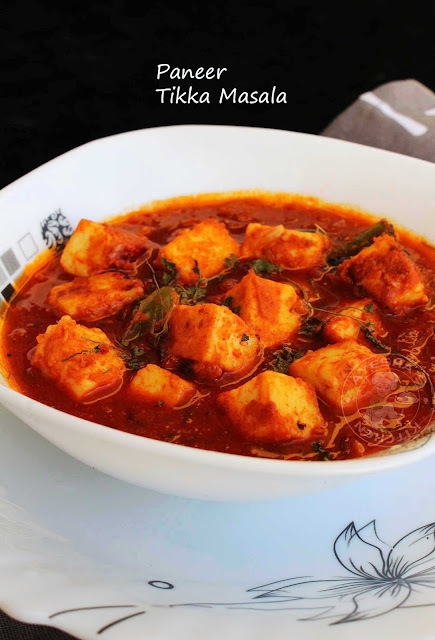 Some popular recipes with paneer are paneer makhani, mutter paneer recipe, paneer butter masala, paneer tikka, shahi paneer recipe, palak paneer, chilli paneer recipe etc. 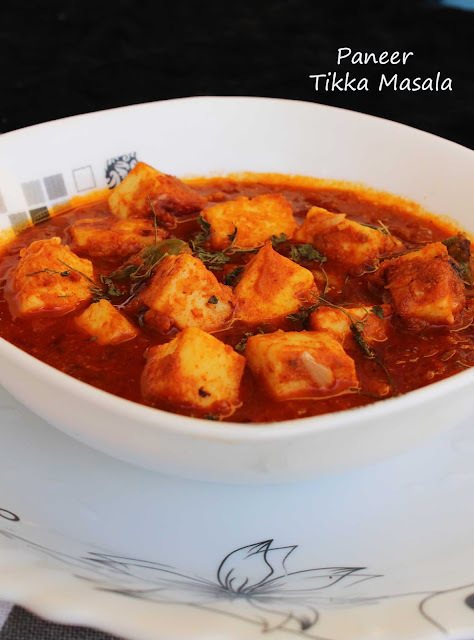 It is very simple to make paneer at home. All you need are milk, vinegar or lemon juice, salt. Just 3 ingredient recipe. You can also go for store-bought paneer for making these delicious indian dishes. So let's move on to the recipe showing how to make paneer tikka masala. Here is my recipe showing how to make paneer tikka masala on stove top/paneer tikka masala/paneer recipes / indian vegetarian side dishes/tikka / stove top recipes/stove top cooking/paneer recipes. Grind together all those ingredients given under 'for marination' without adding water to a smooth paste. Marinate the paneer cubes in this marinade and keep refrigerated for 2 hours. (if you are using store bought frozen paneer, then soak it in salt water for few minutes to make them soft). Heat a tawa, melt 2 tsp of butter and toss the marinated paneer until both sides are golden. Set aside. Now heat 2 tablespoons of butter in a kadai / wok. Add ginger and garlic chopped. Saute until the raw smell disappears. To this, add chopped onion and saute until golden. Meanwhile, grind the chopped tomato to a fine puree without adding water. When the onion is done, add the tomato puree to it. Cook well until mushy. When done, add milk and cream mixture (combine well milk and cream in a bowl). Mix well. Add sugar and check for salt. Finally, add the paneer tikka to this sauce and simmer for 8 minutes until well incorporated.